On Monday we had a great breakfast out by the beach, then we took a walk through town, Kona is a great little village with lots to do. Had lunch at the pool and got some sun on my white body, rested up and talked with my friend and fellow fly fisher David Taylor who lives in Hilo on the east side of the Island. 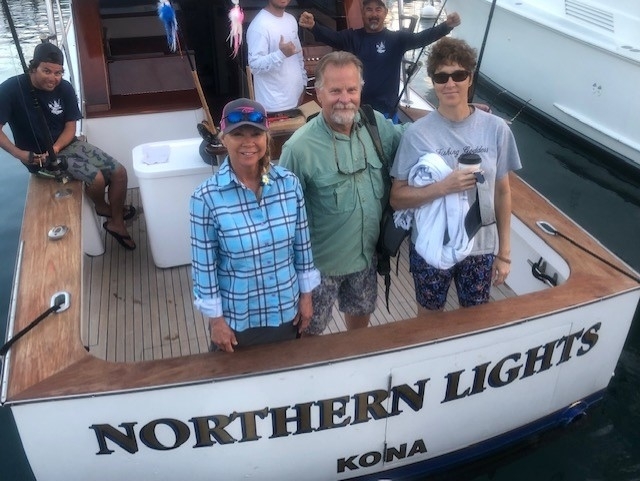 David and his wife Laura are heading over to Kona to Join Wanda and I to spend 5 days fly fishing for Spearfish, Here in Kona, aboard my friend Kevin Nakamaru’s 37 foot Merritt “Northern Lights” with mates David Borges and Kyle Vannatta. Tuesday, February 5, 2019, Kevin picked up Wanda Hair Taylor and I at the “King” and drove us out to the marina at 6:30 am. We met David and Laura Taylor at the marina then boarded “Northern Lights” and had about a half hour of rigging up my TFO Blue Water Heavy Duty and Medium Duty fly rods, with Mako 9700-B Fly Reels, RIO 550 GR Leviathan fly lines and an assortment of my Marlin Flies along with some Cam Sigler Flies, and a few of Kevin’s flies. We rigged for all tippet classes from 2 pound to 20 pound as most of the ladies tippet classes for Spearfish accept 20 pound are vacant, we hope to break some world records if these rare Spearfish show up. At 7:00 am we headed out to calm seas and a beautiful sunny day, put out the teasers and headed off shore. 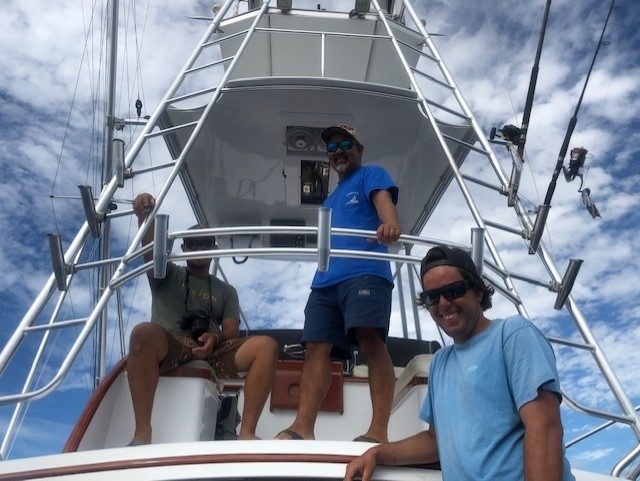 As I was speaking with Dave and Kyle about the many clients who have caught spearfish on fly with this crew on this boat, I learned that they had not caught any Blue Marlin on fly. At 9:00 am we raised a fish which came in hot, I saw that it was m Blue Marlin and not a spearfish, so I quickly adjusted the drag on the MAKO fly reel to the one pound setting, made the cast, hooked the Marlin, and eight minutes later we tagged and released the first Blue Marlin (150 pounds) on fly for team Northern Lights. Later in the day we raised another Blue Marlin and a Spearfish however they would not bite. What a great day aboard Northern Lights. Wednesday February 6, 2019, Today we had another beautiful day, at 7:00 am we cleared the marina and headed off shore, we decided to head back to the same area where we were yesterday, at 9:00 we raised a couple fish which would not tease and finally around 2 pm we raised a fish. Wanda was the angler and had my TFO Blue Water HD rod with the Mako 9700 Marlin reel, along with one of my Big Head Pink and White, large tube Marlin Flies rigged with a single Gamakatsu 8/0 hook and she made a perfect cast. That 33 pound spearfish jumped on that big marlin fly as if it was really hungry, Wanda had adjusted the drag to exactly 3 mounds of pressure before the cast and set the hook with a short jab, after a couple of minutes and a few short runs she turned up the pressure to 6 pounds and wound in what turned out to be a 33 pound spearfish, which is a potential ladies IGFA 20 pound class tippet fly rod world record fish. We fished the rest of the day but got no more fish raises, we pullet in to the marina at 5:00 pm where we weighted and measured Wanda’s fish, took a bunch of pictures, filled out the IGFA forms, and put the fish on ice for a later Hawaiian celebration. That night we had an excellent sushi dinner right across the street from our hotel. Thursday, February 7, 2019, Today we loaded up with 16 pound class tippet and went out at 7:00 am to look for spearfish, Kevin headed south to an area where some spears had been caught, sure enough we raised 2 fish within half an hour around 9:00 am. One was a spearfish the other a small striped marlin, Laura was up but the fish would not tease close enough to get a cast to them. Then at 3:00 pm we raised a double, one spearfish and one striped marlin, again the tease did not allow for David to get a cast to those fish (very disappointing). 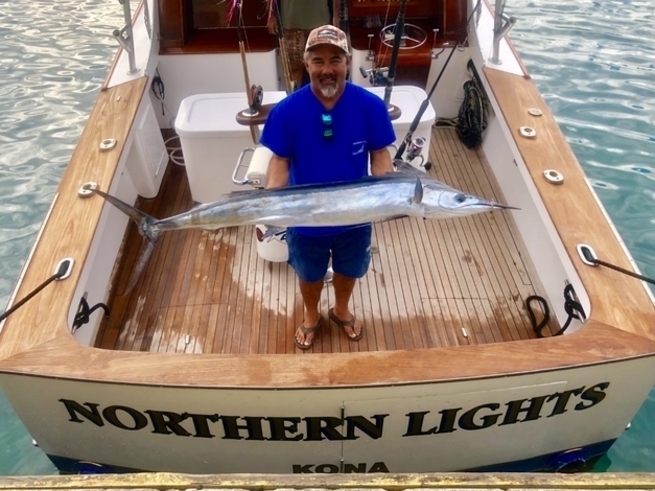 The first three days we had a east wind and the seas were calm, the forecast calls for a wind switch to the north, hopefully this will turn the fish on, we shall see, great trip with my friend Captain Kevin Nakamaru and his team so far. Friday February 8, 2019, Today Wanda and Laura decided to stay in and relax then do some snorkeling and enjoy relaxing in Kona. David Taylor and I headed down to the marina where we met up with Kevin, Kyle, and Dave at the “Northern Lights” at 7:00 am the wind was 5 knots out of the north and the seas were calm to a light chop. 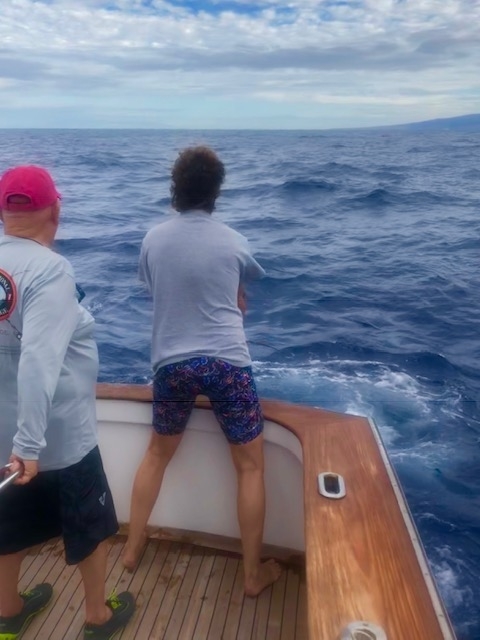 Today we worked hard trying to catch a spearfish as the wind gradually increased and the seas built all day, by 3:00 pm the wind was 20 knots from the north and it was getting pretty rough when we decided to call it a day, we raised no fish today. It looks like tomorrow may be a bit rougher with 25 to 30 knot wind, we may take the day off as it is hard to fly fish for billfish in rough conditions and this is a vacation in an awesome spot. So far this has been a great fly fishing adventure, I feel that this location, with Kevin and his crew aboard “Northern Lights” is the perfect location for me to run some more of my “Billfish Fly Fishing Schools” at certain times of the year on special moon phases. This is one of the very few places where you can target these Spearfish consistently, on the fly tackle. I plan to be here during parts of February and March in the future to catch the rare Spearfish on fly, feel free to contact me for more information on this fishery. There is also a very good chance to catch a billfish grand slam here with a Blue, and Striped, along with a Spearfish, all on fly, I Love My Job, stay tuned for more reports to follow.